Glenda zoomed past reception, glancing back momentarily, to see if I noticed. A wisp of swirling vapour, stagnant, and only detectable to the eye, had easily penetrated the glass barrier. Glenda had found a way through the glass ceiling and succeeded where no woman had done before. There goes the Duchess of Spice, I thought. The ah-ha moment is the new idea. Bringing to life the place to be, everywhere, every time. Glenda was on a mission to the highest peak of Klink Pty Ltd; to be ordained, the king kahuna, the anointed one, el presidente. 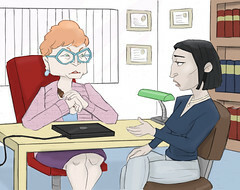 Corporate Human Resources provided the perfect smokescreen for Glenda and the platform she needed to leverage her career. She was a power woman, eloquent talker, supported by a tribe of loyal working bees. Glenda was the Queen Bee of a department providing a dominant support base, except for me, the token male. A sideways move to the new role of Manager for Corporate Decency, even I was not clear what his role meant. Perhaps it did not matter, as my position carried little substance anyway. No one pressed me for work anymore and time was abundant. It was obvious to everyone that after 12 months at Klink, I had been parked and politically outwitted. A position description was still not completed and no one seemed to care. I was a man trapped in a women’s world, a corporate Venus that even the Greek Goddess of love, Aphrodite, would have found appealing…. This entry was tagged business, corporate, corporate politics, corporate psychos, Glass ceiling, Human resources, People, Relationships, short storey, workplace, workplace bullying. Bookmark the permalink. Corporate psycho is the latest book from Anthony Ranieri. This blog publishes weekly snippets from the book based on the Corporate Psycho theme.